Jerica's been active her whole life, from dance to hiking trips with her family. Her most recent adventure was a year in Peru. 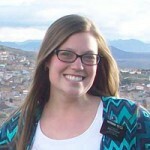 Jerica's part of Smith & Edwards' web team and writes about ways for you to plan your next adventure. What is the most frustrating thing about installing your dryer? For me, it’s all the hoses and attachments, and then, getting them to fit in the laundry room without crushing them. Even more frustrating is how awkward it is to try to lean over your dryer with the hose clamp and screwdriver to install or clean the ventilation hose. Luckily for you, and for me, Ziggurat Products came up with a solution to our problem. Snap-to-Vent connectors make this job quick and easy! The best part about Ziggurat Products company is that it’s local, right here in Ogden, Utah! Check out the Snap-to-Vent 90-Degree and Snap-to-Vent Straight connections on SmithandEdwards.com. 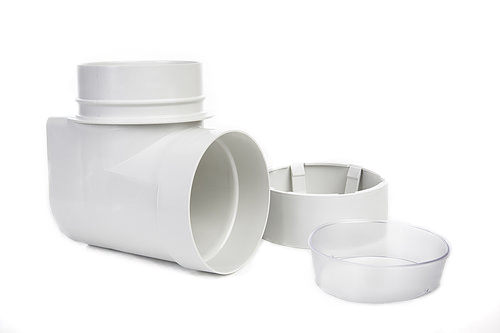 If your dryer duct and wall duct are relatively close together, you will want the Snap-to-Vent Straight design connector. This is an easy connection for installing your dryer, and if you ever need to take it back apart for maintenance or cleaning. 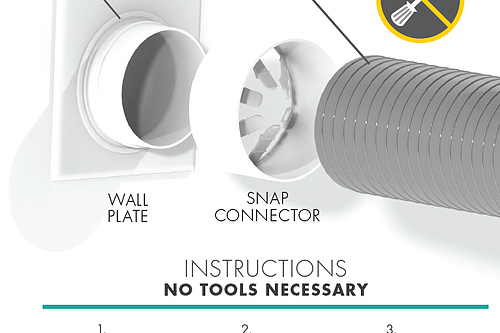 Simply pre-connect Snap-to-Vent Straight before you go behind your dryer for installation. Place the snap connector over dryer hose with tines on the inside of the hose. Take the straight and place it so that the tines push against the hose holding the connector tight to the dryer hose. 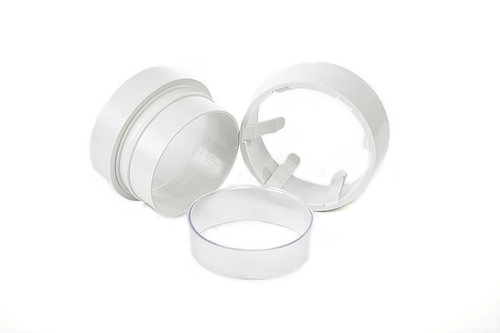 Take the seal ring and either put it around the duct or in the straight and press into the duct until it creates an air tight seal. Easy enough! 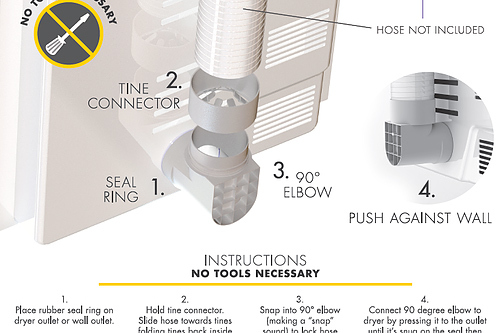 The Snap-to-Vent 90-degree Elbow connection helps to avoid smashing your hose by connecting the hose at a 90-degree angle to your dryer. It comes with easy instructions: Pre-assemble the hose to the snap connector and the snap connector into the 90-degree elbow and snap together. Take the seal ring and pre install onto dryer or wall duct and press the 90 elbow into the dryer duct or wall duct. And voila! The elbow connector can push right up against the wall and still keep your hose protected and working how it should. Having a clean and clear vent reduces the risk of fires and improves the efficiency of your dryer. With no tools necessary and less time and confusion during installation, how could you not love Snap-to-Vent! After a long, cold winter, it’s time to clean up. Planting new flowers, mowing the lawn – all the little things to make your yard beautiful again. It’s the time of year to break out all our lawn care equipment again. As people are preparing for the summer, we often get questions about troubles getting all the tools tools to start up after long, cold winter storage. Stale fuel. Fuel doesn’t last forever. If it doesn’t get used, it can get old and stop functioning how it’s supposed to. Try refilling with clean, fresh fuel. Click here to check out the best EPA-compliant fuel cans we’ve found. Spark plugs. This is a very common solution for blowers not starting. Check your spark plugs, and if any of them have build-up, it’s time for a replacement. Air filter. Check that your air filter is clean and not plugged up. If not, you know it’s time for a change. Fuel filter. Not as common, but equally a potential solution. Check that your fuel filter isn’t clogged up. If that’s the case, replace it with a new filter. 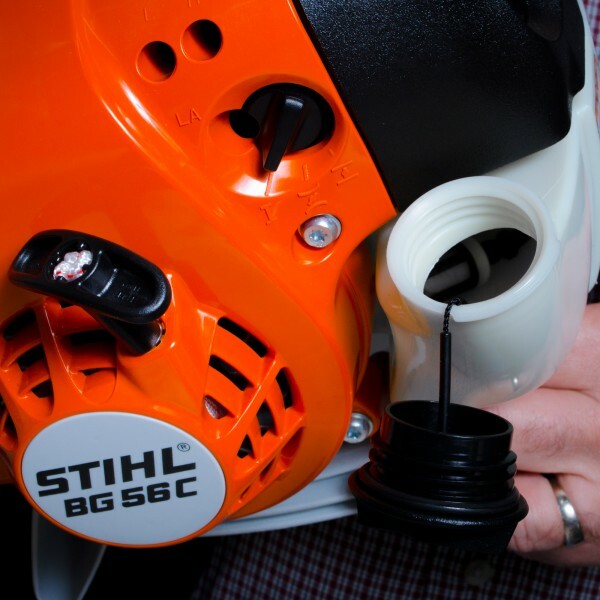 Note: Not all models of Stihl Gas Powered Leaf Blowers are the same. Check for your model manual by clicking here. 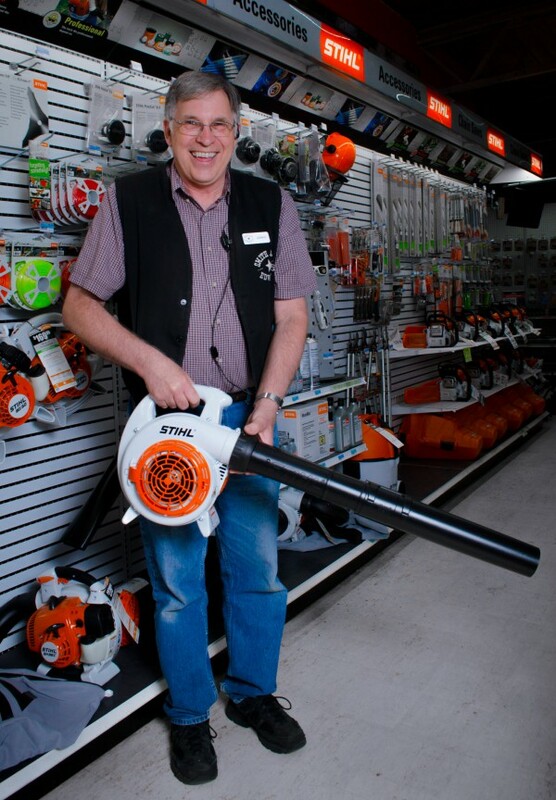 Thanks for the leaf blower tips, John! Thanks John! 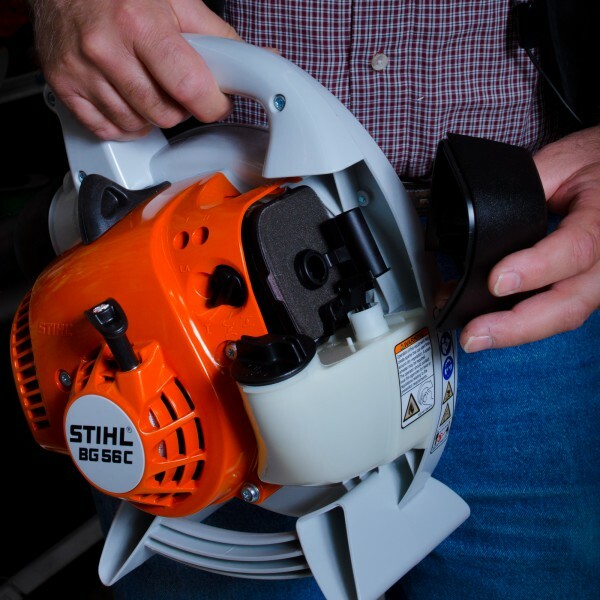 These are his best tips, and if these don’t work, you can consult your blower model’s manual for more advice here at stihlusa.com. 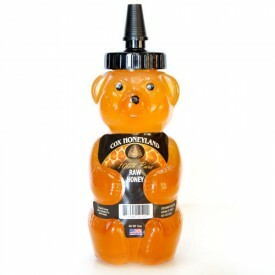 Why We LOVE Honey: Cox Honeyland! 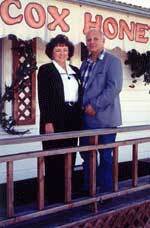 Henderson and Marion Cox started in the bee industry in St. George, Utah. Since then, the family has carried the tradition of bee keeping and honey production, and in 1989, Cox Honeyland opened for business. Now, the fourth generation of family is running the business in Logan, Utah, with more things than just honey, including lotions and other food items. Here at Smith & Edwards, we have proudly carried Cox Honeyland for the past 20 years. Honey has so many benefits! Besides being all natural, healthy, yummy and sweet, it makes a great food storage item! On top of that, there are other cosmetic uses that not many know about. What’s even better? 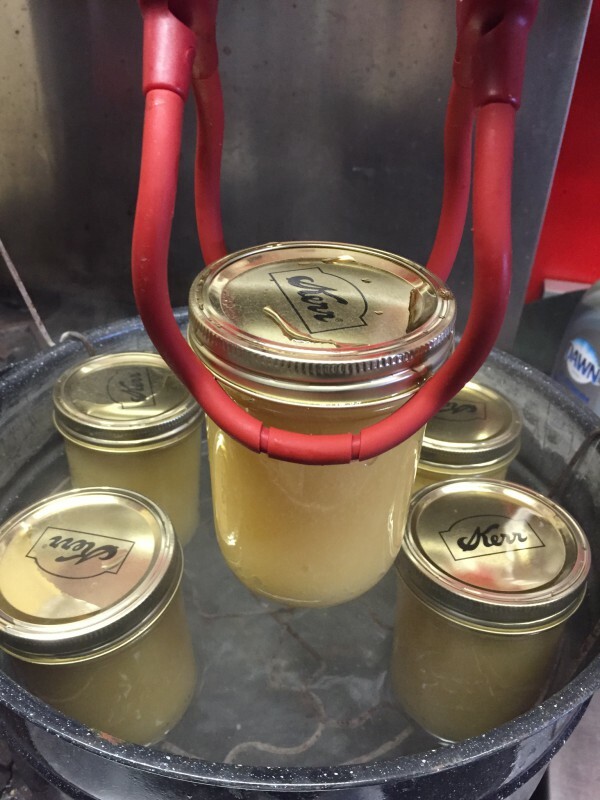 Finding honey that is harvested locally! Why is local honey better? We love the local Cache County honey from Cox Honeyland. Have you ever had honey that tastes or looks a little different than other jars? Honey bees fly as much as 55,000 miles within a 5 mile radius, all the while collecting nectar from flowers. The nectar gathered from a specific region will give the honey produced a slightly different taste and color. Cox Honeyland honey has three different honey varieties: Clover-alfalfa (lighter color and mild taste), Cache Valley (darker with more flavor), and Mountain Snowberry (mountain wildflower flavor). So wherever you get your honey from, it will be slightly different than honey from another place. A benefit of getting local honey is that it is said to help boost immunity for seasonal allergies. Naturally made, honey is healthy for you. Tip: Have a sore throat? Mix honey with a spoonful of lemon juice in a mug filled with steaming hot water to soothe your throat and relieve congestion. You can tell honey is pure when it crystalizes. That means that there are no preservatives added to the honey. The great thing is that honey never expires! (Which makes it great as a food storage item!) When it does crystalize, simply place the jar in a pan of warmed water and it will soften back to its smooth texture. Honey is great for various different uses, some can be surprising! As a natural sweetener, honey makes a great substitute in recipes for sugar. Using this replacement in some recipes reduces up to half of the sugar a recip e calls for. Cox Honeyland has recipes using honey – Click here to see them! Honey also has cosmetic benefits. “My dad would have us wash our faces with crystalized honey as kids. When honey crystalizes, it makes a great natural exfoliator”, Maleesa with Cox Honeyland told me. 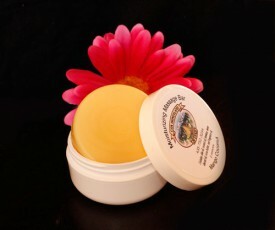 You can also use the beeswax to make your own lip balms, lotions, massage bars, and more. Now that you know why we love honey so much, it’s time to get your own! 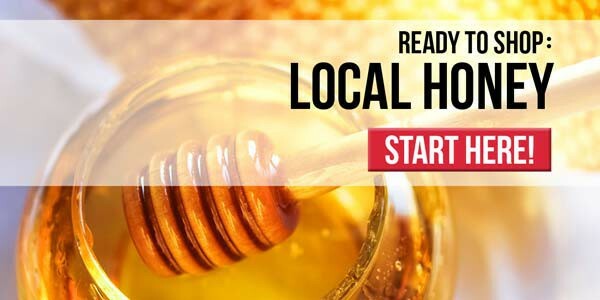 Whether it’s for your food storage, cosmetic benefits, or just to enjoy now, local honey is the best! 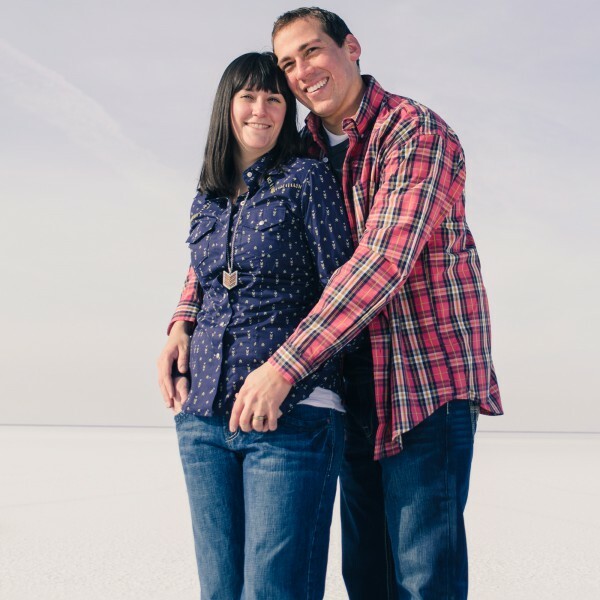 “You had me at yellow” is how this young couple came to be. Spencer, part of the Sporting Goods team here at Smith & Edwards, and his lovely new wife Emily, said they would love to be the models of our new Valentine’s Day outfits. 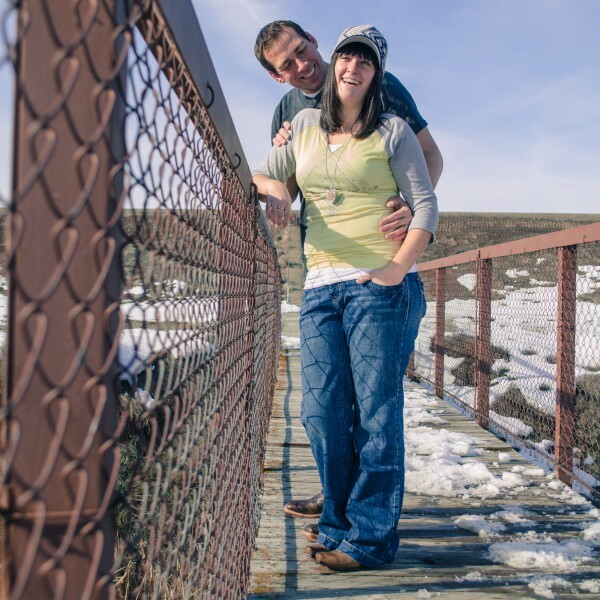 So, we took them across the road to Willard Bay, and what a beautiful winter day for this cute couple to spend together! Emily looks amazing in this cute yellow and gray raglan tee from Cruel. The 3/4 length sleeves and geometric pattern print on the front are both comfy and stylish. And she’s combined it with a Cruel hat with navy and yellow embroidery to match the geometric design of her top. Do it like Spencer, flirty in a lightweight gray t-shirt from Hooey. It’s great on its own, or you can combine it with a nice button-up for a dressier look. He’s wearing a Stetson pink and blue plaid button-up shirt loosely over top. Keep it comfortable in jeans like Spencer’s Regular Joes by Tin Haul, and Emily’s Bailey Cinch jeans. Emily has this written all over her with this fashionable navy blue Cruel cotton button-up shirt with cute stitching and arrow print. With all of her outfits, Emily has added the perfect touch with some arrow designed jewelry from Rock 47 by Wrangler. And for the finishing detail, Emily has on Latigo Tucson boots from Tony Lama. These are perfect for any outfit with a great tan color and beautiful decorative stitching. Spencer sports Hooey Twisted X boots with stitching up the dark leather shaft and Hooey embroidered logo on the vamp. Click here to shop cowboy boots on our website! A big thanks to Spencer and Emily for modeling and standing out in the freezing cold with us! They did amazing, and it was so much fun to do this shoot with them. Valentine’s Day doesn’t always mean pink and red! Mix it up with these “You had me at Yellow” and “I’d be Blue without you” fashions this Valentine’s Day. Cute Valentine’s Day puns courtesy of Kelsy in the clothing department at Smith & Edwards – Thanks Kelsy! 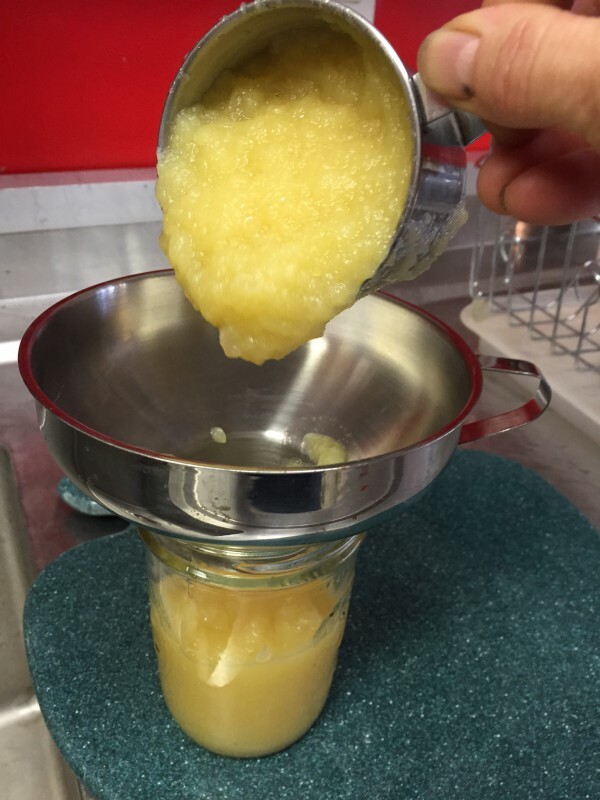 How to Can Applesauce in 6 Easy Steps! Fall is here! The leaves are falling, the wind is cooler, and it’s time to get ready for winter. One of my favorite ways is by storing all the delicious food we have enjoyed in the summer, so we can have it in the winter as well. 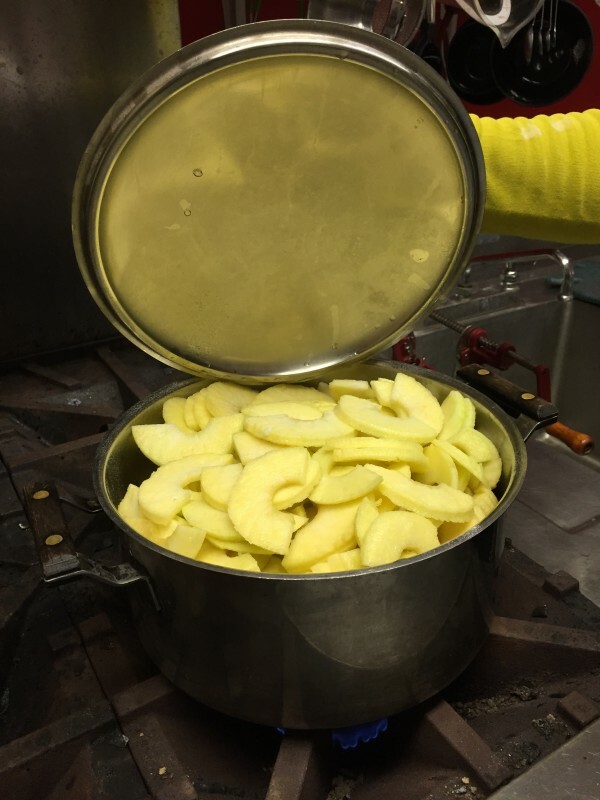 Vickie Maughan, our canning and housewares department manager, shared with us her great recipe for making canned applesauce at home. And we want to share it with you! Start by washing your apples. Peel them, and then slice them. 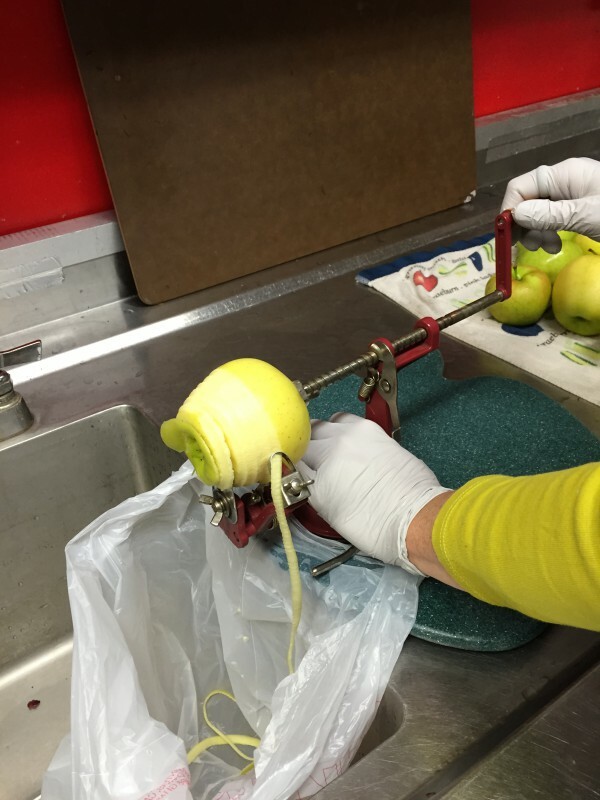 Vickie used a peeler machine to take off the peel and slice them. Get your own peeler here! Cook the apples in 3/4 cup of water on medium heat. 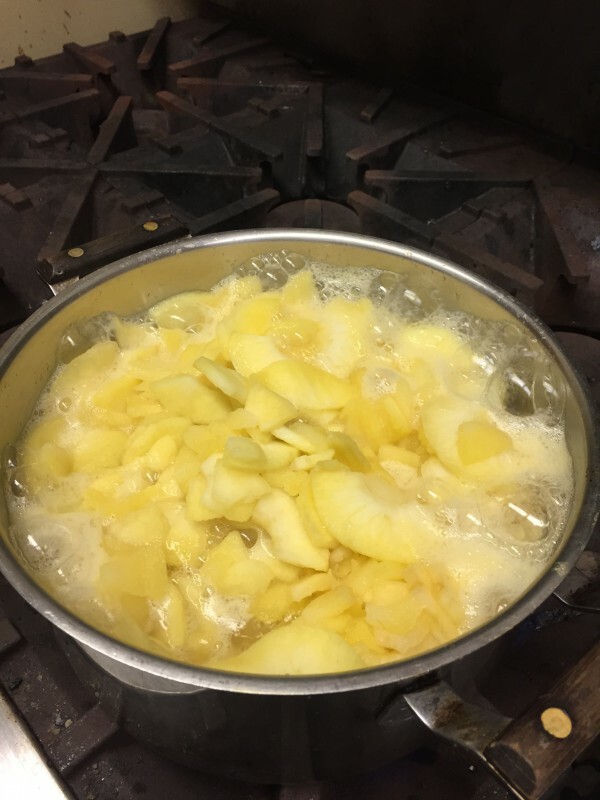 When they reach a boil, lower the heat and steam them until the apples are tender. 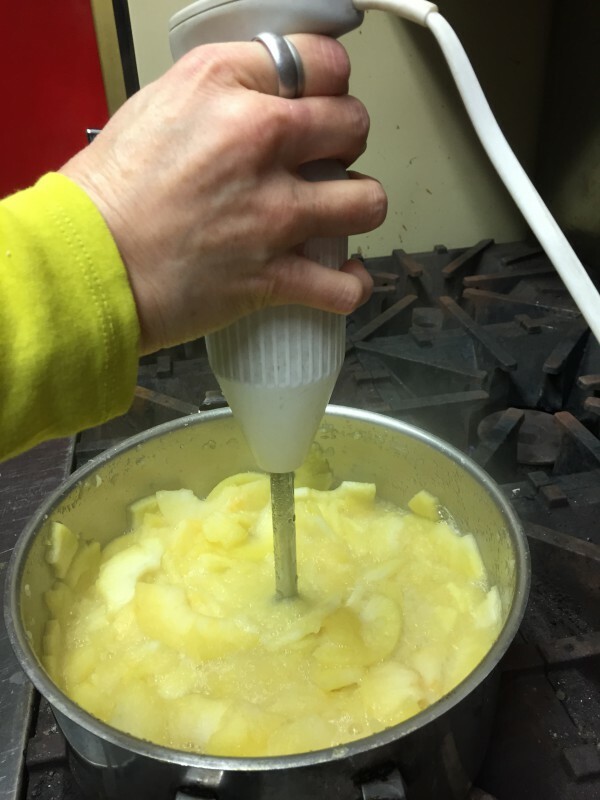 Then, using an immersion blender, blend up the apples until it reaches your desired consistency of applesauce. If you want to enjoy it right away, finish up by sweetening and seasoning however you like it. If you would like to continue to can and store for food storage, continue with the next steps. When you have reached desired consistency, sweeten and season to how you like. Next, fill the jars. Using a funnel is so helpful for easy cleanup! Wipe clean to avoid problems with sealing the lids. 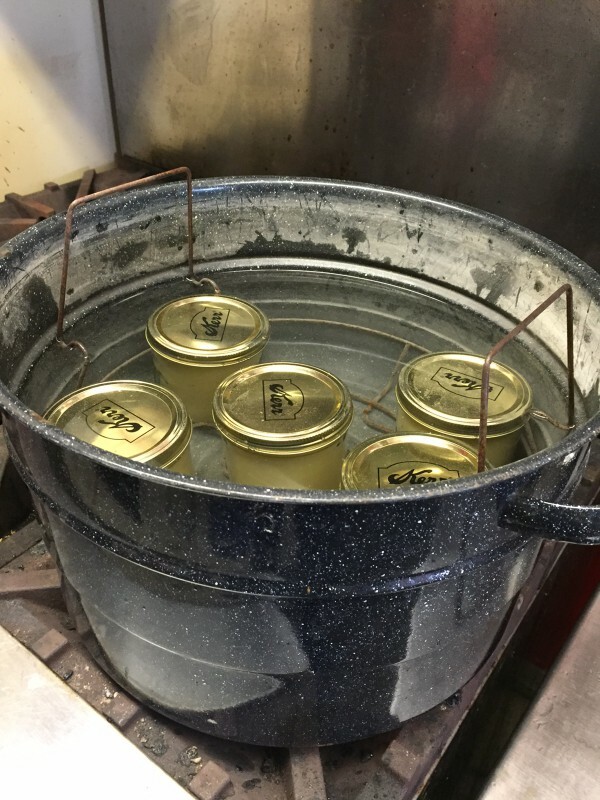 Tighten lids and place jars in pot with water just above the level of the jars. Bring to a boil for 20 minutes. Careful! When you take out the jars, they will be very hot. Use a good jar lifter to protect your hands. And voilà! Delicious applesauce to enjoy and share with your family and friends. But you better hurry! You have just under 2 weeks left in apple season to get your apples for delicious applesauce. Stop at Pettingill’s and get your apples soon! They are closing for the season on Halloween, October 31. Make sure to like Pettingill’s Fruit Farm on Facebook, and then take a peek at when we stopped in to Pettingill’s in August. I have always looked at Rodeo Queen contestants and wondered how they got all their outfits to match so perfectly. It’s incredible! From their hats, to their boots, and even their horse tack, it is all the same shade. 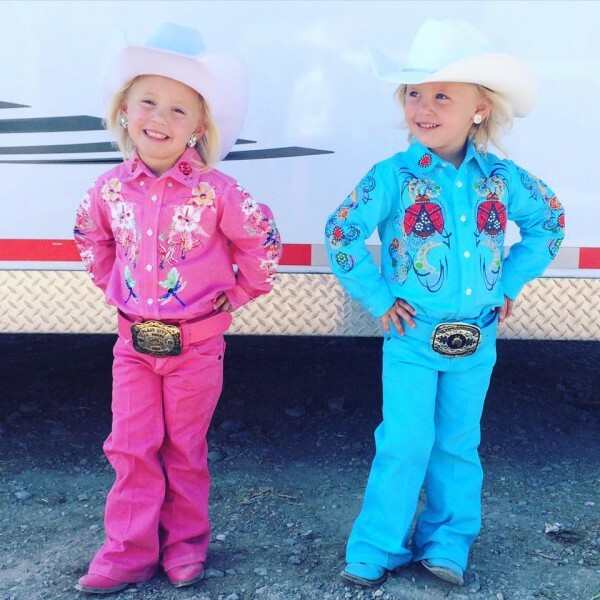 A frequent question we get asked is, How do I dye my own rodeo queen outfits? So, we asked around to give you the answers. If you’ve ever tried to dye your own rodeo outfits, you’ve experienced just how hard it really is. Sometimes they can turn out, and other times the whole batch is botched. So we talked to Ron Hansen, owner of the Rodeo Ink Company. We got the chance to sit down with him and talk to him a little bit about his business Rodeo Ink and dyeing rodeo outfits. S&E: How did you get started? Ron: Ever since my little girl started doing rodeo queen contests, I’ve started dyeing her outfits. 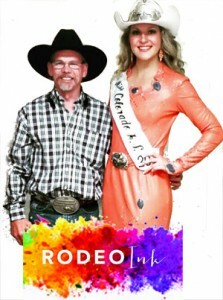 Pretty soon, word got out, and I began sending out dye orders for rodeo queens all over the states. It’s been 5 years now since I’ve started, and since Rodeo Ink opened for business. S&E: What are some common mistakes people will make when dyeing on their own? Ron: Well, dyeing is kind of a tricky thing. Many times, people don’t take into account all the different materials and dyes you have to use to get the same shade on everything. People can very easily can ruin a pair of jeans when dyeing. I hear a lot of “Help me fix this!” and a lot of times, stripping the dye out again is nearly impossible. So I help people start over. Some good jeans to start with when dyeing are white Wranglers, style 13 or 14, and blank white boots. That way the dye goes on in its pure color, and you’re not overlapping and getting strange colors in the end. S&E: What does a rodeo queen need dyed? Ron: Just about everything! That includes shirt, jeans, boots, etc. Even reins, saddle pads, and custom tack. I can dye all those all the same color to match the outfit. Also, I have a contact with someone who does custom jewelry, airbrushing, and more. S&E: What other events do you do dyeing for? Ron: I do stuff for high school rodeo queen contestants, horse shows, Western pleasure, Texas stock shows, and even youth competitions – not just high schoolers. Also, I have worked with State Queens and Miss Rodeo America contestants. S&E: What’s rodeo queening’s effect on families? Ron: Rodeo Queening is a great program for families. I have been involved in rodeo for more than 30 years and I was a rodeo clown & bull fighter for about 13 years. My whole family has been involved in rodeo for 10 years now and we have learned a lot, and not only about rodeo. Being involved in rodeo queen pageants teaches kids about responsibility and self-worth, which is something that can help these kids out a lot when growing up. Thank you Ron! He gave us some awesome tips and ideas and we hope that those were able to help you as well. He’s got a knack for dyeing and says that he can match any color you send him. He recently added a new gal to help him out during the peak season, where they send out about 10-12 pairs in a week to orders from all across the United States and Canada. If you would like to get into contact with Ron, or would like to look at some of his work, here you can check out his Rodeo Ink Instagram or his Rodeo Ink Facebook page. Or, if you are interested in dyeing or other gear, come visit us in Ogden, UT, off I-15 at exit 351 – or, click here for Women’s Jeans, Girls’ Jeans, Paracord, and Tack. Looking for white jeans for ladies and girls participating in pageants? Check out this link to our favorite Women’s White Jeans and Girls White Jeans. Can SureCan…? This gas can sure can! Now, I know what you’re thinking… another gas can?? Yes! 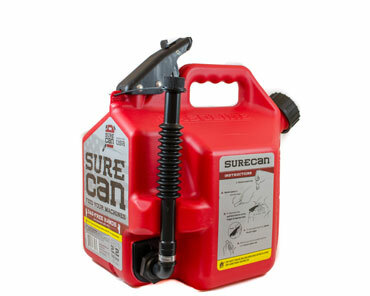 SureCan is a new and renovated gas can that is becoming popular in various local businesses, including here at Smith and Edwards. The SureCan is made in the USA and the company is local here in Ogden, Utah. The Standard Examiner just recently featured Brad Ouderkirk, owner of the SureCan, in an article as well. Click here to see the article. 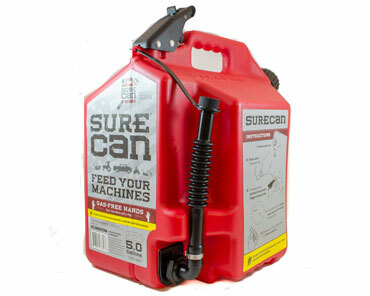 You can win your own SureCan gas can this week! Scroll down to enter to win. We know and understand the typical issues with gas cans… they tip over and spill gas all over, they are hard to aim when pouring into your machine, and they can leak. The frustration is discouraging and totally not worth it. That is why I wanted to tell you about this awesome, brand new product we are carrying! 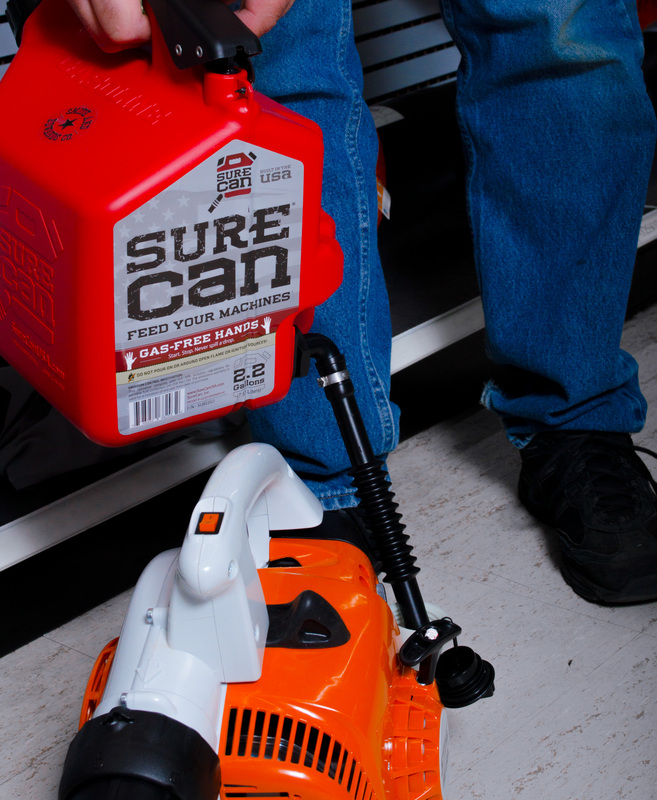 The SureCan gas can is guaranteed no spill, no leak, and gas-free hands after using it. But what makes it different from other gas cans? I asked Randy, our Lawn and Garden department manager, exactly what makes it unique. “The features speak for themselves,” Randy told me as he showed me the flexible, rotating nozzle and the thumb-release trigger. No more messy tipping and aiming! After using this can, we have had people tell us just how easy it is to use. “Lifting a 5 gallon gas can and tipping is not easy,” Randy says. But this new, renovated gas can solves that problem. So yes… SureCan sure can! Click to get your 5 gallon SureCan! Click to get your 2.2 gallon SureCan! Also available in store at Smith and Edwards! Exit 351 off I-15 in Ogden, Uah – Find it in the Lawn and Garden department in the front of the store. This container complies with U.S. EPA emission regulations for portable fuel containers (40 CFR Part 59). The emissions warranty is valid for a minimum of one year from date of purchase. See all Boating accessories, Camping, Hiking, Hunting, Fishing, and more. Yep… it’s that time of year again. Kids running around dressed up, pretending they’re pirates or cowboys with their imaginary swords and guns. Well, let’s make their game of pretend a reality! 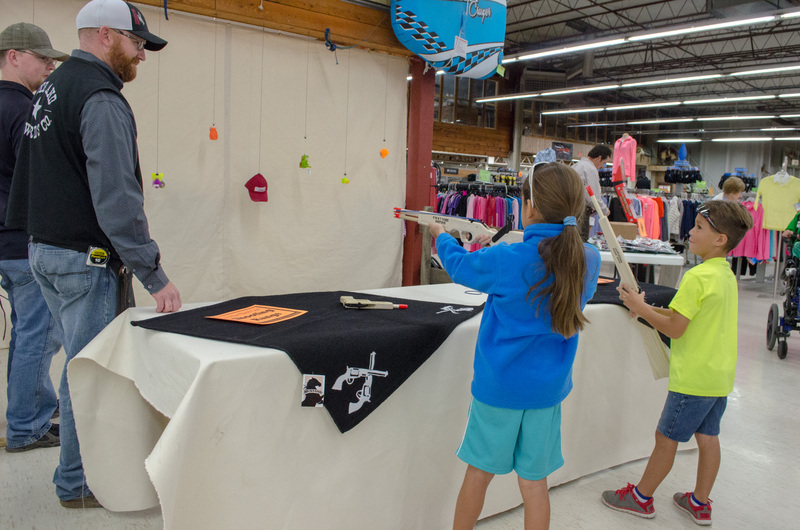 No… not with REAL swords or guns… but here at Smith and Edwards we have Wooden Toy Swords and Rubber Band Guns that your kids will just love! Kids dream of having their own gun or sword as a part of their Halloween get-up: from pirates to soldiers to their favorite comic book character. Yes – all the wooden guns feature the orange plastic safety tip! 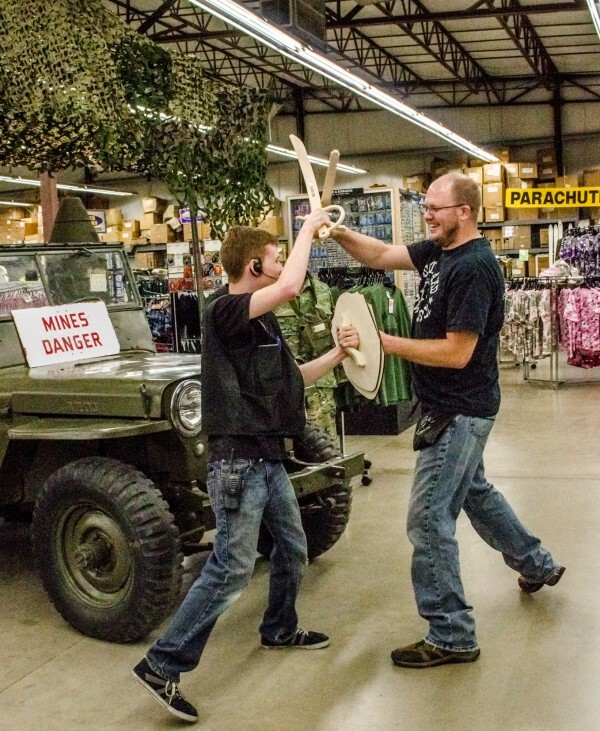 Click this link to check out all our different models of Wooden Swords, Shields, and Rubber Band Guns. 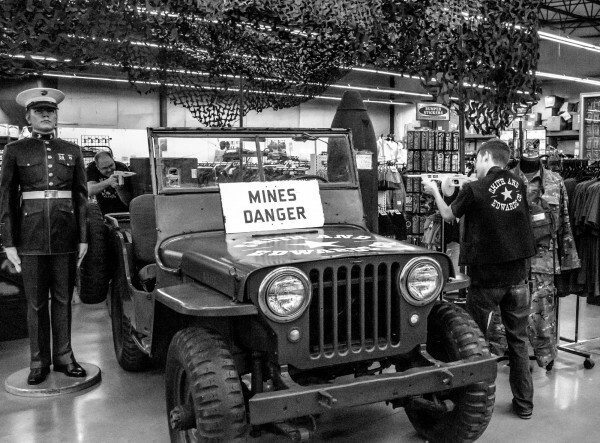 The jeep in the surplus department has seen some serious fights! So make your child’s Halloween costume complete this year with cute additions such as these wooden toys. Even if it’s not Halloween, these are great gifts for your child to play their heart out anytime. Looking for more creative ideas for this Halloween? Melissa and Ashley, part of the team here at Smith and Edwards, has awesome ideas on Halloween Mason Jar Decorations. 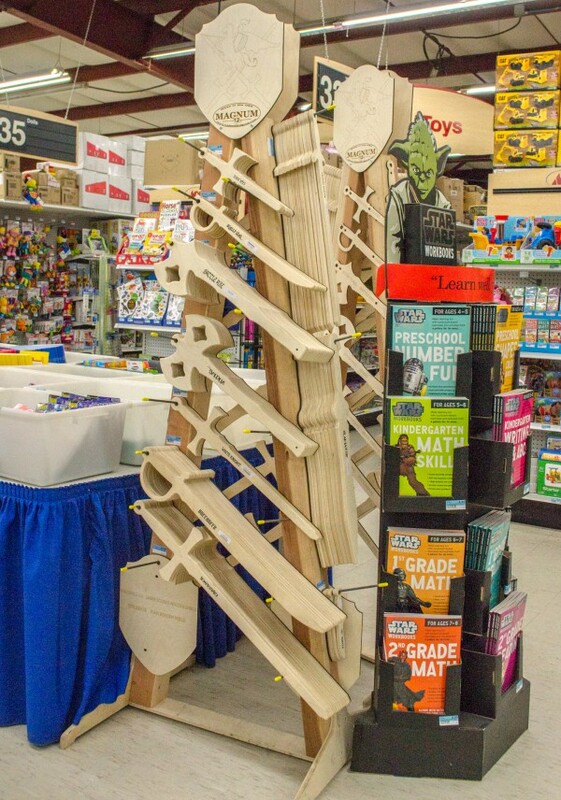 Click here to explore all our wooden toy swords and rubber band guns! 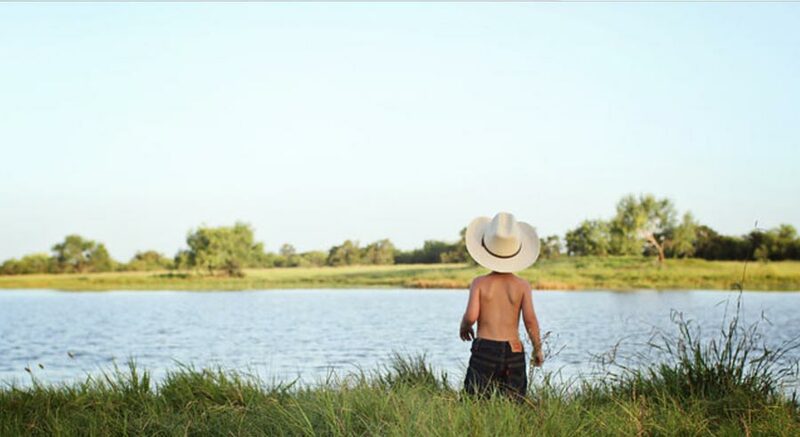 Whether you’re working out on the ranch, or goin’ out on the town, a young cowboy or a timeless one, some things just never change. Just how Wranglers have been around for what seems like forever and they have never lost their style. As for the Egger family, passing on these timeless traditions to their kids, as well as adding some of their own, is a must. We recently had this cute little family buy some of the 100% silk Wild Rags we sell here in our store. Afterwards, they sent us some beautiful photos they had taken of their young son, Colton, by Sallie Scott with Country Grace Photography. Colton’s set up camp and he’s ready to play! The photos turned out so cute! 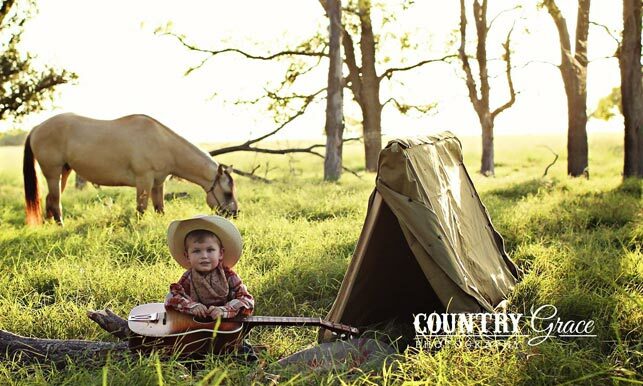 This little cowboy is a natural. And he’s got on a Wild Rag! If that doesn’t convince you they’re good looking, I don’t know what will. The Eggers aren’t the only family loving these scarves. Marty Thompson, our Western Tack manager here at Smith and Edwards, and his family also love them. 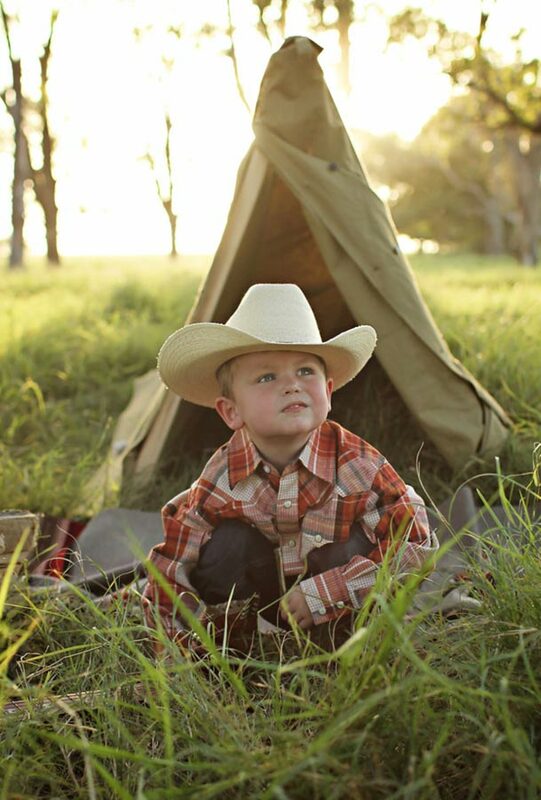 His cute kids know a couple different ways tie a Wild Rag to be the slickest lookin’ cowboy around. Click here to see Marty’s son Wells show you How to Tie Wild Rags. Besides being good looking, Wild Rags are really very practical. They can keep you warm in the cold, and wick away the moisture in the heat. Use them to filter out dust in their air and breathe through it, or to filter out dirty water to drink. And those are just some of their many uses! They come in many different designs and colors, you can choose whichever fits you best. Here at Smith and Edwards, we happen to have a wide selection of Wild Rags to choose from. Click here to see Wild Rags. So enjoy your own! Just like the Egger family, you can send us photos of how you use your Wild Rags! Just send us an email at info@smithandedwards.com. 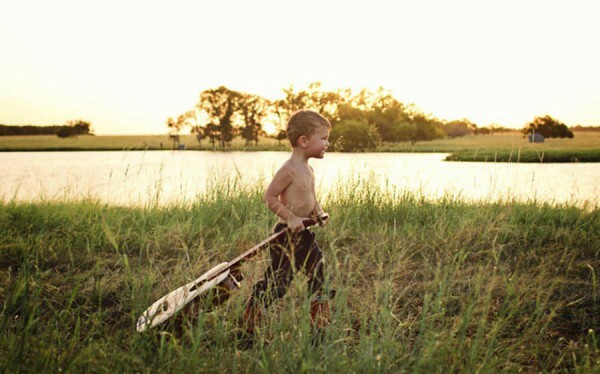 And just like Colton, you can be toughest and most handsome cowboy out there. Special thanks to Colton Egger, his dad Clint, and photographer Sallie Scott of Country Grace Photography! How to Freeze Corn – Plus Easy Corn-Cutting Method! What do you do with all that left-over corn you made for dinner? Throw it out? Stick it in the fridge, forget about it, and then throw it out? Not anymore! With this easy video & guide, you don’t need to let the words “canning” or “food storage” intimidate you. Melissa in our Housewares department will walk you through the steps. 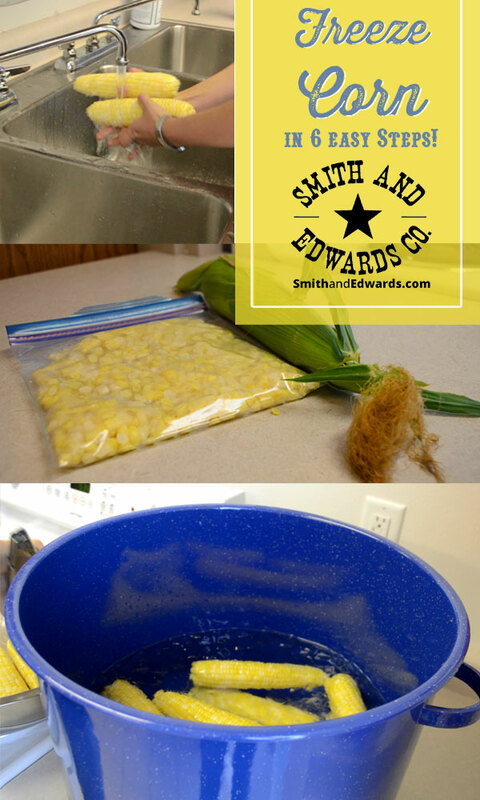 Easy Frozen Corn Storage: Watch How! Now, this is something I have done with my family since I was a little girl. We have our own garden and we love corn. So when it is corn season, we all get together to freeze our own corn for storage. It’s so simple and the corn comes out with that same fresh-from-the-garden taste. Shucking means to take off the husk and the silk hairs. As Melissa shows in the video, one easy method is to hold the corn between your knees and pull the husk toward your body. Wash the ears of corn and remove any remaining silk. Blanch (or boil) the corn in boiling water for about 6 minutes. 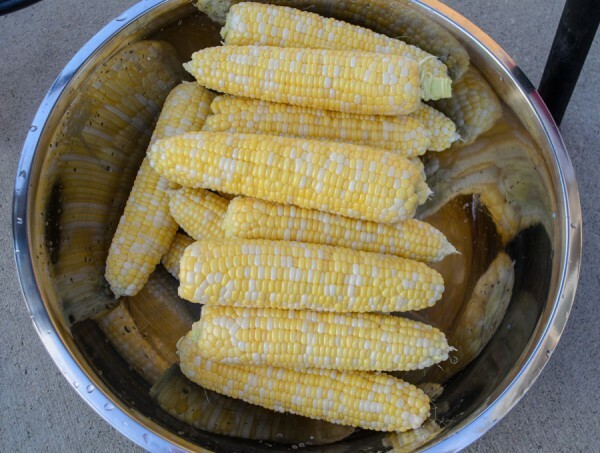 The reason behind blanching the corn, is to stop the enzymes that can make the corn taste bad later. Cooking it first helps preserve the flavor when you want to eat it later on. 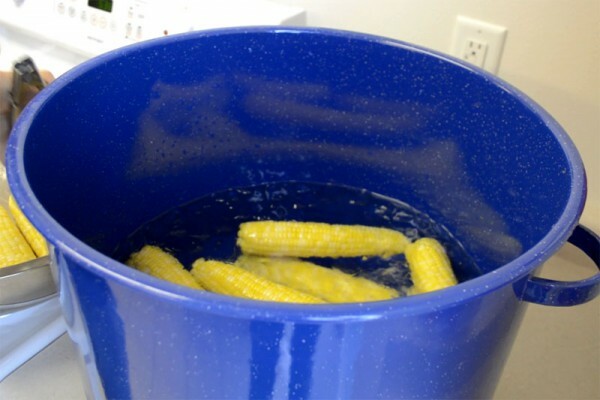 After blanching, take a pair of tongs and place the corn in ice water to slightly cool them off, just until they’re cool enough to handle. Cut the corn off the cob. Now, this part is optional. If you like, you can freeze them whole, on-the-cob. After step 4, you would wrap them in plastic wrap and then put those in freezer bags to freeze. But if you like, you can take a knife and cut the kernels off the cob to freeze. In my family, we have always cut the corn off. It’s your choice! TIP: To cut the corn off the cob, you can put them in the center of a Bundt pan. This will hold them as you cut off the corn and it will fall right into the pan. Also, simply a board with nails pounded through (about 5″ apart) can hold the cob while you cut. To make a nailboard, simply take an extra shelf or spare board. Paint it, then hammer a 4″ nail through it. Then you can simply set each ear of corn on the nail, and safely cut the corn. Now, simply scoop the kernels you just cut off into freezer bags. You can put 1 1/2 to 2 cups in a bag, depending on how big you want your portion sizes to be when you eat them. When the bags are flattened to about 1/2 – 1 inch thick, you can stack them nicely in your freezer to make the best use of freezer space. 11 1/2 dozen large ears of corn should give you about 58 cups of corn to freeze. Vickie, Kitchen Dept. Manager at Smith and Edwards, says to lay the bag with corn flat as you zip it up. When you have about an inch left to zip, squeeze the air out. “If it has air in it in the freezer, it is more likely to get freezer burn,” she says. Melissa has another idea on how to get the air out. She says when you have the full bag, you can slowly lower it into a lot of water, just until it reaches the zipper line. The water on the outside of the bag helps push the water out and you can seal it while still partly in the water. Don’t put too many bags in the freezer at once! If you put a lot of warm things in the freezer, it may begin to thaw out your other frozen foods. But if you put in just a few at a time until they’re frozen, they will freeze faster and won’t thaw any of your other food. Now you have corn to eat for the next few months! It’s a great and easy way to start up your own food storage without the complicated recipes or big pressure cookers. Get a free step-by-step on freezing peaches – plus a printable version of the freeze-corn instructions! Just enter your email address and you’ll get the printable instantly. We would love to hear back from you! If this worked for you, or if you have any other tips or secrets to help others in starting their canning & food preserving, please leave a comment below. If you liked this, you will LOVE our other frozen food storage tips! Make sure you check out How to Freeze Beets and How to Freeze Cherries. Get updates from Smith & Edwards every Sunday! Wrangle Up Your Rodeo Fashion! Grab this badge and show your Smith & Edwards pride on your blog or website! Copy the code above & paste into your website to display your Smith & Edwards badge!